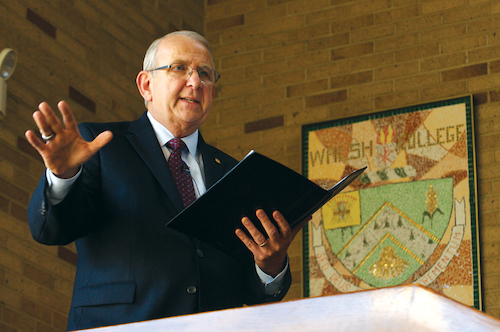 June 2001 – Richard Jusseaume ’67 appointed Interim President of Walsh University. March 7, 2002 –Walsh Board of Directors officially names Richard Jusseaume as Walsh’s sixth president. 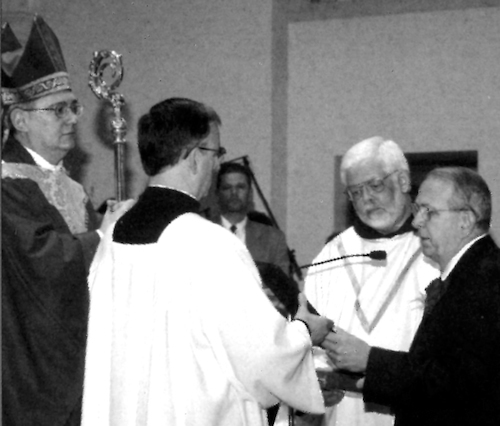 October 19, 2002 – Inauguration ceremony of President Richard Jusseaume at St. Paul Catholic Church, North Canton, Ohio. October 2002 – Funded by the Jusseaume and Frank families, the Prayer Garden is established on campus to serve as a visual reminder of Walsh’s Catholic identity. Winter 2002 – Stein Hall opens, becoming the third apartment-style facility and Walsh’s sixth residence hall. Fall 2003 – Walsh announces design and construction of three new buildings on campus: a free-standing Chapel, Health Sciences Building and a new residence hall. Fall 2003 – Walsh launches a new M.B.A. program at the Medina Campus. Fall 2004 – Walsh University opens its third satellite campus for the School for Professional Studies (SPS) in Canfield, Ohio. In addition to holding classes at the main campus in North Canton, Walsh University’s SPS Program hosted satellite campuses in Medina, Akron and Canfield. Fall 2004 – Walsh’s seventh residence hall opens, the Marie & Ervin Wilkof Towers. October 2004 – Walsh celebrates the successful completion of the University’s capital campaign. At its conclusion, the campaign surpasses its original goal of $22.5 million and raises $23.4 million. Fall 2004 – The acquisition of Hoover Park and the Hoover Historical Center from the Hoover Foundation provides 30 acres of grounds, gathering space and five buildings to the Walsh campus. January 2005 – The Timken Natural Sciences Center opens on the east quad of campus and houses the Division of Mathematics and Sciences. February 2005 – The renovations to the former Rannou Campus Center are completed and a formal dedication ceremony is held to celebrate Walsh’s new state-of-the-art meeting and conference center, the Barrette Business and Community Center. 2005-06– President Jusseaume underscores Walsh’s identity as a Catholic university by incorporating the phrase “Catholic University of Distinction” into the strategic plan, marketing materials and as a goal for Walsh faculty, staff and administration. June 2006 – The Jusseaumes lead Walsh’s first Walsh student pilgrimage to Lourdes, Paris and Medjugorje. August 2006 – Walsh’s eighth residence hall opens, Betzler Tower. Summer 2007 – The Board of Directors authorizes the formation of the first Legacy Group focused on the study and assimilation of Walsh’s history and Catholic heritage to ensure its continuation. Walsh also forms the first Leadership Group to develop potential leaders to guide the University and deliberately plan for the continuation of Walsh’s mission. August 2007– Walsh’s ninth residence hall, the Fred Olivieri Family Towers opens adjacent to Wilkof Towers. May 2007 – Walsh opens a satellite campus in Rome, Italy. Working in collaboration with the Brothers of Christian Instruction in Italy, the campus at Instituto San Guiseppe in Castel Gandolfo is renovated to accommodate Walsh’s new program. The beautiful 22-acre property is located near the Pope’s summer residence and also includes a free-standing chapel. Fall 2007 – The Gaetano M. Cecchini Family Health and Wellness Center is completed and includes the new Klekotka Tennis Complex, Milazzo Soccer Field, and Vasco Sports Athletic Field. A formal dedication ceremony is held September 2008. January 2008 – Walsh officially launches its Master of Arts in Education (MAED) program in Kisubi, Uganda. August 2008 – Walsh launches its first formal “school” with the School of Business. Fall 2009 – The Cecchini Center is completed and includes the new Alumni Arena with seating for 1,900. November 2009 – Walsh University celebrates a successful site visit by the Higher Learning Commission, the accrediting body of the North Central Association of Colleges and Schools. The site visit marks the culmination of a lengthy self-study that began in 2007. Walsh is recommended for the maximum 10-year reaccreditation. July 2010 – Walsh is accepted into the National Collegiate Athletic Association (NCAA) Division II membership process. The move from the National Association of Intercollegiate Athletics (NAIA) signifies an important step for Walsh athletics and the University as a whole. 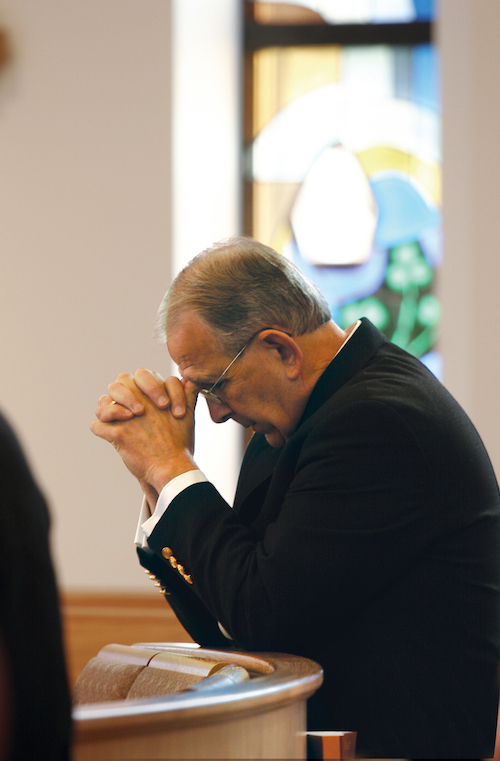 September 2010 – The Father Matthew Herttna Counseling Center, formally dedicated in 2009, opens to the community offering services geared toward area residents who cannot afford clinical assistance elsewhere. November 2010 – Walsh University’s 50th Anniversary Celebration concludes on November 17. The 18-month celebration included events such as a community Festival and Fireworks Display, Black Tie Gala, various cultural events and speakers, including famed author Immaculee Ilibagiza who spoke to more than 3,000 guests on October 22, 2009. November 2010 – The School of Business is officially dedicated as the DeVille School of Business in honor of alumnus and benefactor Roger L. DeVille ’65. Winter 2011 – Walsh announces its second doctorate program, the Doctorate of Nursing Practice. Along with the Master of Science in Nursing degree, these two new programs also mark a significant milestone as the first degree programs to be offered primarily online. August 2011 – Walsh earns its first major federally funded research grant, a three-year, $356,556 grant from the National Institutes of Health. August 2011 – The Environmental Field Center opens at Hoover Park. The four-season center features an enclosed lab and pavilion allowing for hands-on training, testing and experimentation for Walsh's botany and ecology classes. October 2011 – The Division of Nursing becomes the University’s second comprehensive school with the formation of the new School of Nursing. As the largest major on campus, the nursing program has maintained a solid record of climbing enrollment with students who have consistently scored among the highest pass rates on the state licensure exams. January 2012 – The Birk Center for the Arts opens and is dedicated as the permanent home for the growing marching band and choir. Walsh’s newest 13,000 square-foot facility is connected to the south side of the Cecchini Center and includes a visual art studio, atrium, music library, instrument storage, Fine and Performing Arts offices, Dorothy Ling Rehearsal Hall and practice rooms for the Walsh Chorale/Chamber Singers and the Cavalier Marching Band. August 2012 – Walsh opens its 10th residence hall with the completion of the Commons Residence Hall and welcomes the first group of Br. Francis Blouin Global Scholars. Fall 2012 – With an increase in the number of faculty research grant awards, the Office of Grants and Sponsored Research is established. Winter 2013– Walsh launches the first phase of We Believe: The Campaign for Walsh University. July 2013–The Cavaliers become a full NCAA Division II member. September 2013–The Walsh nursing school is formally dedicated as The Gary and Linda Byers School of Nursing. December 2013 – Garnering international media attention, on the same day he is named Time Magazine’s “Man of the Year,” Pope Francis accepts a hand-made card from a group of Walsh students studying in Rome, Italy, as part of the University’s Global Learning Program. July 2014 – Walsh earns its first National Science Foundation (NSF) Grant for $600,000 to benefit chemistry student scholarships. August 2014 – Walsh announces the new School of Arts and Sciences. Walsh’s third comprehensive school houses the divisions of Humanities, Language and Letters, Mathematics and Sciences, and Philosophy and Theology, which together offer more than 24 majors. August 2014 – Walsh establishes the new Division of Health Sciences. January 2015– Walsh celebrates the opening of the St. John Paul II Center for Science Innovation. This two-story facility features new and innovative laboratories and learning spaces to support various programs. Additional features include a human anatomy lab with an interactive virtual dissection table, an occupational therapy lab, an advanced chemistry lab, an exercise science lab and more. April 2015 – Walsh celebrates the successful completion of the first phase of the We Believe Campaign. May 2015 – Walsh dedicates the new Biery Baseball Stadium and Tim Mead Field. July 2015 – The Byers School of Nursing receives a Health Resources and Services Administration (HRSA) grant for $600,000 to support the development of Advanced Nursing Education. July 2015 – Walsh announces that it will move to the Great Midwest Athletic Conference (G-MAC) for the start of the 2017-2018 academic year, reinforcing the development of a significant, all-private school athletic conference. August 2015 – Walsh launches eight new majors and announces the formation of the new Division of Fine and Performing Arts. In total, the University has added 14 new majors in the past two years. Fall 2015 – Walsh adopts test-optional admissions policy, joining more than 800 universities nationally to not require standardized test scores for student applications. January 2016 – Four DeVille School of Business students launch The Garage Student Innovation Center. January 2016 – Walsh MBA program announces new partnership with St. John Institute in Denver, CO.
April 2016 – Dedication of the new Rambo Family Advanced Nursing Lab. April 2016 – Walsh announces fourth comprehensive school with the School of Behavioral and Health Sciences. September 2016 – President and Mrs. Jusseaume attend canonization of Walsh Honorary Alumna Mother Teresa in Rome. October 2016 – Walsh launches new Master of Occupational Therapy program. November 2016 – IBEW Local 1985 donates its North Canton Main Street building to Walsh for preservation of the labor union history and Hoover Company legacy. March 2017 – More than 300 attend the International Food Waste and Hunger Summit at Walsh. March 2017 – Partnership with The Knights of Columbus establishes $500,000 endowed scholarship program. April 2017 – Archbishop Christophe Pierre, Apostolic Nuncio to the United States, gives commencement keynote address and receives Walsh Honorary Doctorate of Humane Letters. May 2017 – Walsh recognized with the prestigious Noel-Levitz Retention Excellence Award, one of only three universities in the U.S. to be honored. 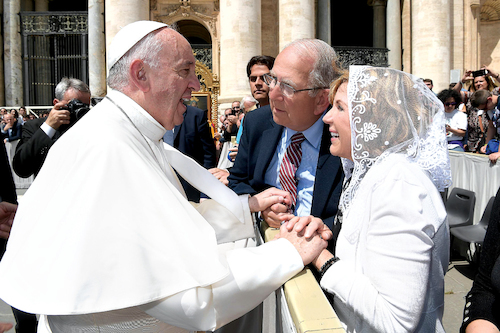 May 2017 – Walsh University President Richard Jusseaume and First Lady Theresa meet with His Holiness Pope Francis during the Wednesday, May 10, Papal Audience at St. Peter’s Square in Vatican City. During their meeting, President Jusseaume presents Pope Frances with the newly established Walsh University student scholarship named in honor of His Holiness. August 2017 – Walsh launches Digital Campus encompassing nine programs and the addition of Bachelor of Business Administration degree for Adult Learners. September 2017 – Walsh is awarded $300,000 grant from the U.S. Department of Justice Office on Violence against Women to support Cavalier Safeguard Initiative. December 2017 – We Believe, the largest capital campaign in Walsh history, exceeds all goals and surpasses $30M Goal with the conclusion of the five-year campaign that began in 2012. January 2018 – Walsh formally opens the Marlene and Joe Toot Global Learning Center, Walsh’s most technologically advanced building on campus. February 2018 – Walsh celebrates the consecration of the Saint Teresa of Calcutta Chapel in the Global Learning Center. April 2018 – Grand Opening of the James B. Renacci Forum and Center for Civic Engagement. April 2018 – Walsh launches new Master of Science in Nursing Acute Care Nurse Practitioner program. May 2018 – Walsh University earns its first two NCAA national championship titles with first place finishes by seniors Marcus Myers and Sarah Berger at the NCAA Division II Outdoor Track and Field National Championships. June 2018 –The Marlene and Joe Toot Global Learning Center is honored by the Northeast Ohio NAIOP Commercial Real Estate Development Association with the Award of Excellence for Mixed Use Architectural Design of the Year. July 2018 – Walsh partners with Pegasus Farms and Rotary International in establishment of the new Military Family Center. August 2018 – Walsh launches new undergraduate degree in Cybersecurity. October 2018 – Walsh announces new Psychiatric Mental Health Nurse Practitioner doctoral degree. November 2018 – Walsh rededicates Alexis Hall in honor of longtime benefactors Ann and George Seanor.